I woke up at 10 AM, perfect timing to get ready for the ride home. I sat in bed for a while and wrote out a postcard to my friend, Leah, as I tried to shake the post-sleep cobwebs from my brain. We watched the weather reports and things didn't look great. After some debating, we decided to just get out as soon as possible and try to beat the worst of it. Like a well oiled machine, we were packed, bundled, ready, and on the road at 11:45 AM. 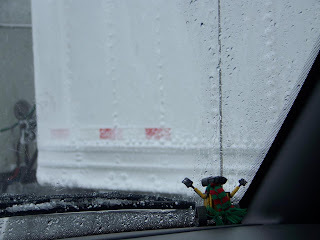 As we rode the freeway out of Toronto, we hit a little bit of snow, but nothing of any real consequence. The wind gusts were the worst part of it. 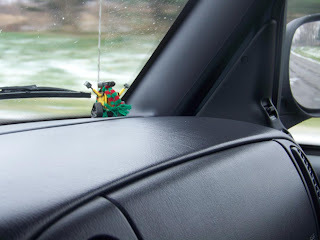 Back on Day 1 of this trip, I wrote "As we approached Buffalo, the weather got bad. Real bad." In hindsight, that was but a flurry. When we hit Niagara, we were hit with whiteouts. I've driven through some heavy snowfall, but I've never seen anything like this. In a matter of seconds, everything beyond the windows would vanish, swallowed by pure white. It was disorienting and actually pretty scary. 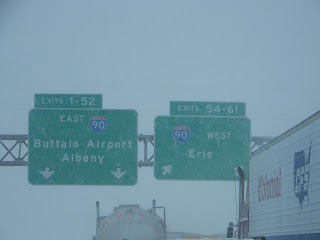 We pushed on, crossed the border, and made it to Buffalo...where things got even worse. 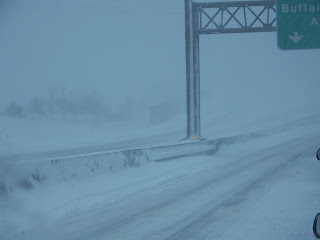 The whiteouts were more frequent and the road conditions became far worse. The three lane highway became a two lane parking lot as the already slow moving traffic came to a complete stop. At times, we would go for well over an hour without moving so much as a single inch. When we would finally start moving, speeds would rarely reach 15 mph, but never higher than that. My overpriced iPod adapter didn't even get used, as we wanted to keep listening to local radio to hear what was going on. 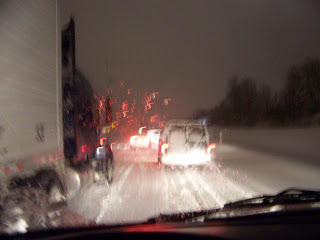 Eventually, all daylight was gone and we were still stuck on 90 West in the same awful conditions. In the dark. Our plan became to make it to the Angola rest stop for a break and then decide if we should keep driving or hang there until sunrise. Upon arrival it didn't even look like the rest stop was open. The entire parking lot was buried under several inches of snow. Eventually, we saw people go in, so we at least knew it was open, but there was no possible way for my wheelchair to get through all that snow and get inside. Luckily, the guy who was plowing the parking lot was extremely helpful and cleared a path right up to the door for me. He even cleared a parking space near the door for us and made sure we got inside. The drive from Toronto to Angola should have taken us about 2 hours. It took us 8. 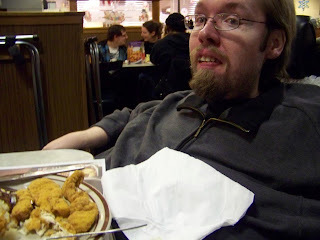 Once inside, we made our way to Denny's, got some food, and tried to figure out what to do. We made a couple calls and checked online, it seemed that if we could make it past Erie, PA, we'd be in the clear. Our decision was made for us by a phone call to the restaurant, informing them that the freeway had just been closed. We were spending the night. Our awesome waitress, Elke, was really helpful and nice throughout the night. 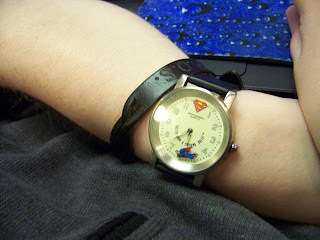 I set up shop with my laptop to pass the time and keep tabs on the weather situation. There were about a half dozen other travelers spending the night there. Some had pulled into the parking lot and gotten their car stuck in a snow drift, so they just left it and came inside. 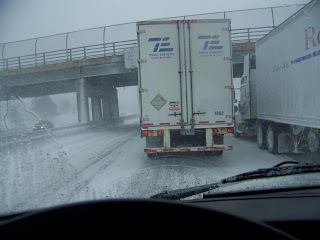 Later, a few semis pulled in, also got stuck in drifts, and ended up completely boxing the car in. It was such an odd scenario and, honestly, kind of creepy. 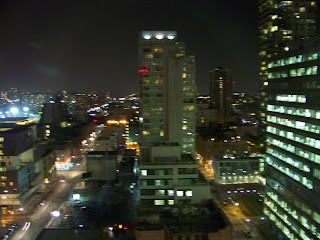 Sometime during the night, Mom and I went to see how the road looked from the windows in McDonald's. It seemed so bizarre to see people sleeping in every booth inside the place. I felt like I was in a zombie movie. We were a band of survivors holed up in a secure facility, waiting to hear something from the outside, trying to decide if we should stay put or try to make a break for it. Mom managed to doze off for a few minutes throughout the night, but I was way too wired to sleep. Eventually, the sky started to lighten as the sun unsuccessfully tried to peek through the clouds. We ordered small breakfasts before Elke went home and resumed our stay-or-go debate. Neither of us wanted to spend another night in a rest stop Denny's, but every time the freeway reopened, it closed again within minutes. We decided to get off of 90 and push for home via Route 20. We set out again at 9:30 AM. 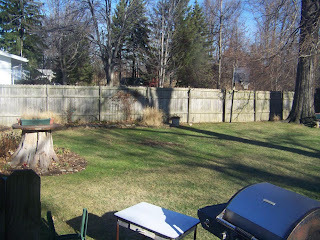 It was still bad, but at least we had daylight on our side. 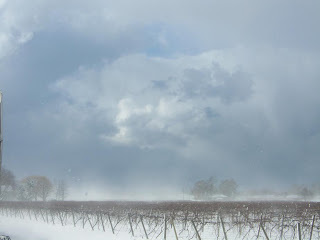 For hours, all we saw were vast snow-covered grape fields and tiny towns, each one looking exactly like the last. 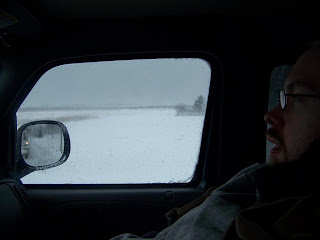 Winds would come sweeping across the fields, picking up snow from the ground and repeatedly slamming us with whiteouts as we crawled down the long, boring road. We were moving slowly, but I was just happy to be moving at all. We would occasionally come to a halt, but none like the day before. I had been up for a full 24 hours. 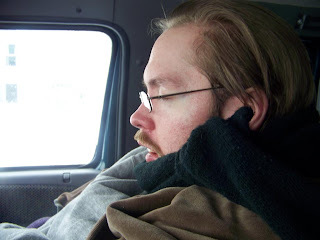 That, combined with the bland scenery, the hum of the engine, and the whoosh of the defrosters, would get the best of me as I found myself randomly falling asleep for seconds at a time. We finally crossed into Pennsylvania just shy of 11 AM. There was a whole convoy of us headed west on 20. It must have been quite a site for the locals, seeing this endless line of big rigs and other assorted freeway refugees slowly filing through their rural towns. Somewhere near Wesleyville, we hit another dead stop. A long one. About a mile or so ahead of us, a semi tried to get up a hill (a very small hill) and failed. This blocked traffic for over an hour. We were losing daylight fast and started to discuss whether or not we should just find a hotel and try again the next day. We were tired, stressed, and all we wanted was to be home. So we pushed on. It was completely dark by the time we reached Girard. That's when my uncles started calling, worried and urging us to get a room somewhere. But we were determined. 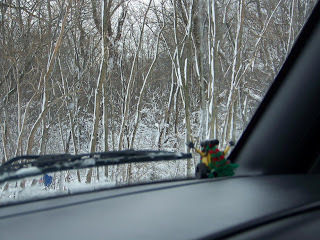 We were finally in familiar territory once we reached a snow covered Conneaut. Just an hour from home if 90 was clear. We decided to try it. Mom and I spent the final hour of the long drive talking to keep each other awake. We got home at 7 PM on Friday night. 10 hours since we last had anything to eat or drink (or had access to a bathroom). Roughly 30 hours since we left the hotel on what should have been a 5 to 6 hour drive. 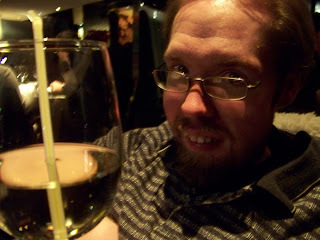 We came inside and quickly ordered pizza and started guzzling whatever liquids we could find. It was a long and sometimes scary vacation. Most things that could have gone wrong did. It was chaotic...but I had fun. It was worth it. I will give it some more thought next time I consider traveling during the winter months, though. PS- Here's the weather we came home to. Christmas Consumer Chaos and The Keg. In Canada. I woke up at 10 AM, very groggy and in a haze. 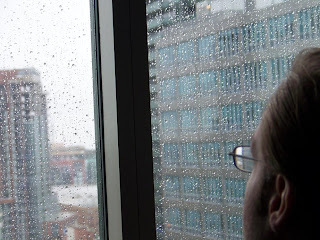 Looking outside, there was none of the predicted snow to be seen, just a dreary, rainy day. 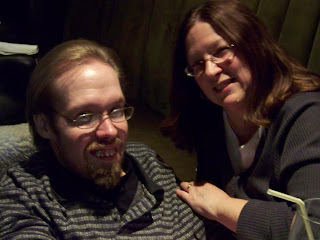 I hadn’t seen my cousin, Mark, in about five years. He lives near Toronto, so we were planning to meet up that day. Mom called him to see what was going on- that was when we found out where all the snow went. He was completely snowed in and unable to get to Toronto. That was a bummer. Hopefully we’ll be able to get together another time soon. 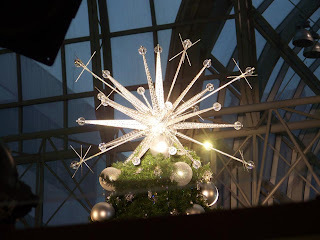 We decided to head over to the Eaton Centre again and spend some time actually looking around. To avoid the rain, we headed back down to the PATH, this time successfully passing the elevator roadblock by removing my leg rests. 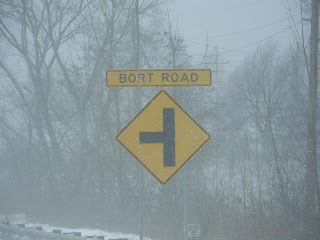 It is...chaotic in the PATH. The fast-paced hustle and bustle of the people combined with the somewhat confusing layout can get you turned around pretty fast. 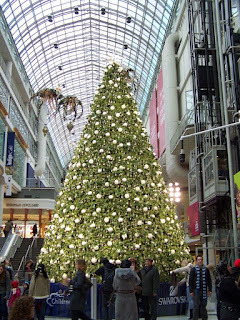 Luckily, we found our way to the Eaton Centre relatively quickly. 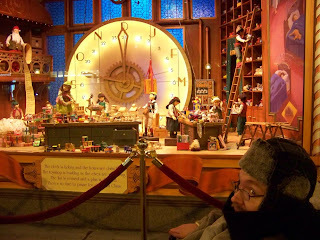 The chaos continued inside, where three floors of Christmas shoppers frantically darted in every direction. We wandered around for a while and stopped in the food court for some ice cream. As we finished, I heard a voice from behind asking “Are you Jacob?” It turned out to be Angela, a MySpace friend of mine who was also at the concert the night before. We didn’t get much time to talk, but it was still a cool, unexpected meeting. Before leaving the Eaton Centre, I bought one of Dala’s CDs and saw the DVD of Dr Horrible’s Sing Along Blog for a good price, so I grabbed that too. We headed back to the hotel for a bit, only to see severe weather warnings plastered all over the news. Apparently, the majority of our road home was set to be hammered by lake effect snow throughout the next few days. 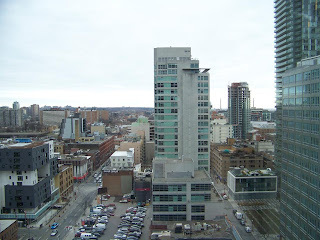 This raised the question of whether we should still leave the next day, as planned, or stay in Toronto and wait it out. We agreed to play it by ear. Having only eaten that ice cream at the food court, it was time to get some dinner. We loved The Keg in Niagara Falls, so we went down to the front desk to ask if there happened to be one near the hotel. They gave us directions and we were on our way. It was only about a ten, maybe fifteen minute long walk, but the constant icy winds made it feel much, much longer. My driving hand was frozen by the time we arrived. The place was packed. 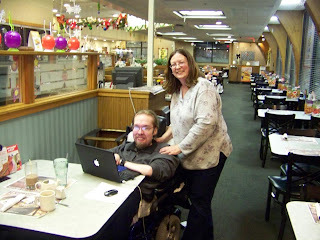 They had a table pretty quickly, but it was a pretty cramped path, everyone would have had to stand up and push their chairs in for me to get my wheelchair through, so we ended up wait waiting 45 minutes. 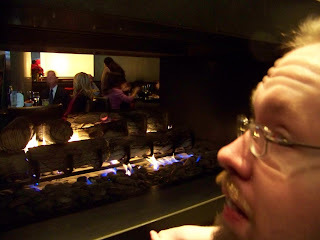 I snagged a spot near the fireplace, so I didn’t mind the wait. Thawing is nice. Dinner was great, I got the teryaki chicken and three cheese baked potato with Jackson-Triggs chardonnay. Totally worth the long, cold trek to get there. The walk back seemed much quicker and warmer, most likely thanks to the wine. 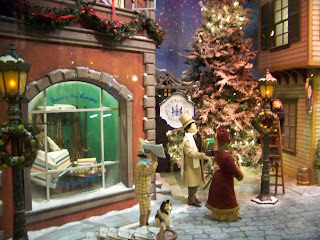 We even paused to snap a couple pictures of the awesome Christmas window displays at The Bay. 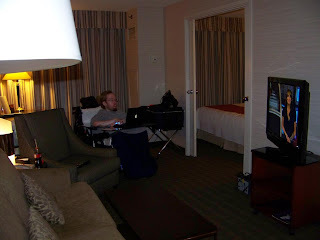 We got back to the room at 10:30 and just decompressed for a while. Flipping around on TV, we managed to catch the day’s installment of ET Canada’s feature on Chantal and Raine’s vow renewal, so that was cool. I was in bed by 12:30. "You Make Me Feel Like I've Gone Halfway Around the World..."
I woke up to that Toronto Tuesday morning at 10 AM with sore eyes from the dry hotel air. Getting in gear for the day was slow going. We didn’t actually leave the hotel room until after 2. Mom and I were looking forward to avoiding the chilly weather, so we made our way down to the PATH. Right off the bat, I was met with a handicap accessible elevator...that my wheelchair could not access. My chair was too long to fit inside. I turned around and up to the cold, windy surface we went. 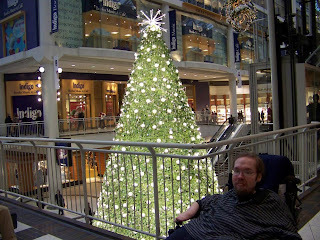 We hurried over to the Eaton Centre in search of a cheap replacement prepaid cell phone. Mine had finally turned back on, but I didn’t really trust it (plus the roaming rates are outrageous). After checking 3 different cell phone stores, the cheapest phone I could find was $50, as opposed to $15 back at home. No sale. 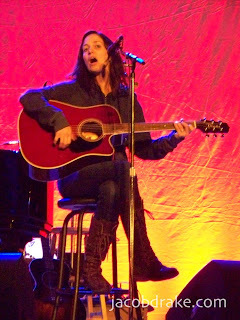 The main point of this whole trip was to see Chantal Kreviazuk at Massey Hall. 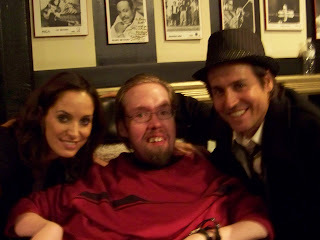 As a bonus, it was the only show of Chantal’s tour that Raine Maida would be joining her. We got out of the cold and into the historic building only to be met by another tiny wheelchair elevator, just like the one in the PATH. This time, though, we had the presence of mind to remove my leg rests, which let me fit inside. Shortly after 3, we were inside for sound check. A few minutes later, Chantal & Raine arrived. Chantal came over and chatted with us for a little while. We mostly exchanged tales of how hectic things have been for both of us. 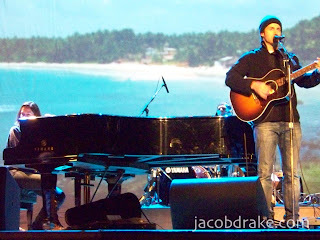 First up during sound check was Canadian duo Dala. I was aware of them, but had never really listened to them before. I was pleasantly surprised and really loved what I heard. I made a mental note to look into getting any CDs they have available. 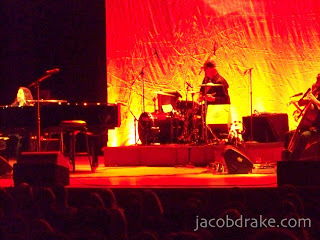 Next up, Raine started his sound check. A few songs in, the cavalry arrived. Chantal’s parents arrived with Raine & Chantal’s kids in tow, as well as Chantal’s cousin and her kids. It was a big ol’ family reunion and Mom and I were smack in the middle of it, watching and laughing as the kids took over the stage while Mommy and Daddy played their songs. After sound check, we had about three hours until show time, so we headed back to make a quick stop at the hotel and then to find somewhere to eat. We tried Baton Rouge, a restaurant in the Eaton Centre. 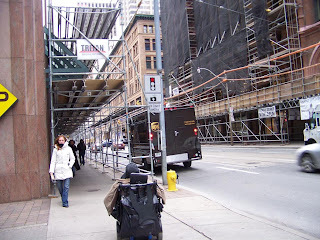 Unfortunately, the doors were too narrow for my wheelchair to fit through, plus it was extremely crowded inside. So, we settled for McDonald’s in the food court. We left the food court around 7:20 to start the walk back to Massey Hall. 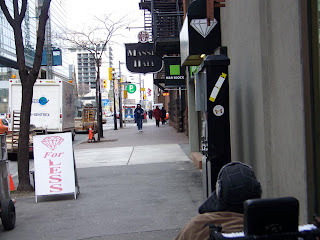 Just before exiting the Eaton Centre, Kathy & Sandy spotted us, so we caught up a little and walked to the venue with them. Not long after getting to our seats, Dala took the stage to start the show. They only played a few songs, including a ukelele-centric rendition of Moon River. My personal favorite song of their set was Horses. 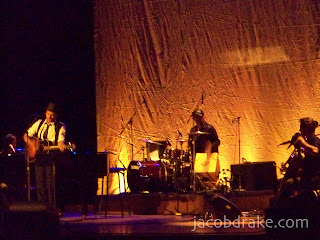 Raine took the stage for his set, which consisted mostly of songs from The Hunters Lullaby. He did include one new song, which I don’t know the name of, but it sounded amazing. He also slipped Innocent in, which is always great. 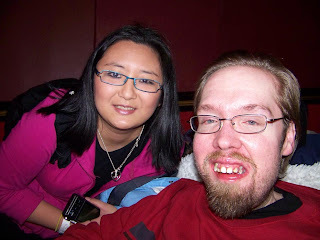 During the intermission between acts, I got to meet Michelle, a friend from the internet and fellow Chantal/Our Lady Peace fan. It was brief, but it was great to meet her. After intermission, it was time for Chantal. She filled the night with an excellent mix of her classic stuff and newer songs from Plain Jane. She even snuck in a cover of Bruce Springsteen’s My Hometown. At one point, Dala came back out and joined Chantal for God Made Me, which was the first song of Chantal’s I ever heard all those years ago. There was also the inclusion of a new song, Not One Drop, a song inspired by the tragic passing of a friend’s young daughter, Sylvie. 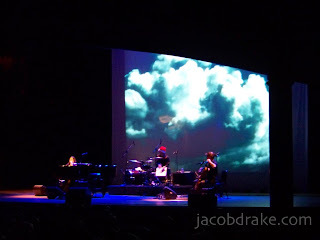 I think the highlight for me was Chantal’s performance of 5000 Days, which featured some great home videos of their kids projected on a giant screen at the back of the stage. 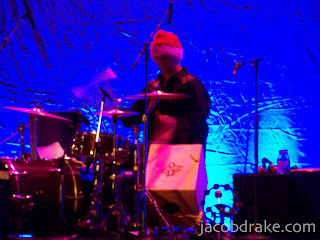 Randy Cooke rocks the Santa hat. And the drums. Later in the set, Karen and Kevin each got their turn to take center stage. Kevin sang a rendition of Joni Mitchell’s River. Karen sang Isobel, a song she wrote for her band, The Done Me Wrongs. Both performances were big change-ups from the rest of the night, yet they somehow fit perfectly. 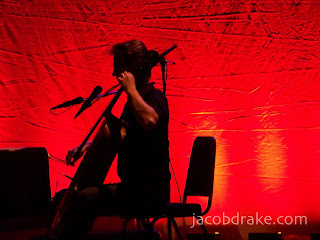 Kevin has crazy cello skills. And wicked posture. After “wrapping up” with All I Can Do, Chantal left the stage before coming back for a two song encore. Just after Plain Jane was over, 5 year old Rowan (who earlier appeared on stage to ask his mom when she’d be done) returned to introduce his brother, four year old Lucca. Lucca marched up to the mic and proceeded to adorably sing a verse of Invincible. Chantal followed that tough act by playing the song herself, bringing the nearly two and a half hour show to an excellent close. That show made this crazy trip totally worth it. We headed back to the elevator and through a couple corridors to the after party. I chatted a bit more with Raine and Chantal as Rowan and Lucca ran around. Before taking off, I got a quick photo with both of them. We said our see-you-laters and left the party. Mom and I bundled up and hurried back to hotel as a light snow began to fall. There was a big snow storm predicted to hit Toronto the next day. Luckily, we wouldn’t be hitting the road until Thursday. W got back to the room at 1 AM and hit the leftovers as we sat and processed everything. I was in bed and conked out by 3:30. Meaning to leave by 10 AM, my alarm clock went off at 7:30. Mom had been packing and getting things ready all night. As a result, she had only been sleeping an hour and a half at that point, so we slept a little later and got up at 9. We were both groggy still, but we were ready. Despite being later than planned, things were going pretty smoothly, until a staple of our roadtrips went missing: the car adapter for my iPod. After about fifteen to twenty minutes of searching both the house and the van for it, I decided we should just leave it behind and go. Granny stopped by to see us off and we headed out to the van. As I went through the front door, I saw my first few snowflakes of the winter. It was a nice little surprise, but also a subtle harbinger of approaching chaos. At 12:20 PM, we finally hit the road. A light snow came down for the first leg of our ride. It was nice traveling on a Monday, the freeway was pretty much all ours. Everything was gray. The sky, the trees, the ground, even the snow looked gray. Ahh, December. Just before we reached the rest stop in Angola, Mom and I heard a small, high-pitched chime. Halfway to Toronto, my fully charged phone died. Item number two on the day’s glitch list. We stopped in Angola to eat and gas up the van. I fiddled with phone, but had no luck. 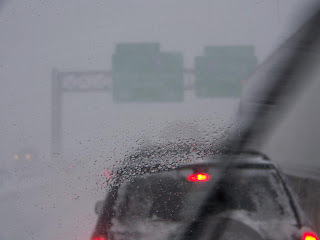 As we approached Buffalo, the weather got bad. Real bad. 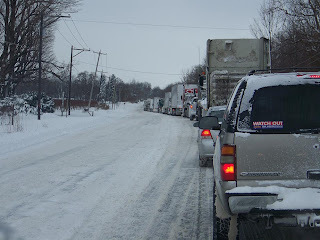 It was rush hour and there was a big burst of lake effect snow coming down. This resulted in us traveling at 10 mph through Downtown Buffalo with about 100 feet of visibility. Mom’s a nervous driver and an extremely nervous winter driver, so it was an interesting few minutes. But we made it through. It was dark out by the time we made it to the Peace Bridge. The next hour and a half on the QEW was nice and uneventful. We pulled up to the Cambridge Suites at 7 PM and were up in our room minutes later. 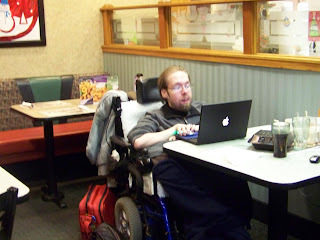 As has happened in the past, the room wasn’t as wheelchair-friendly as I needed, so we had to change rooms. The people at the hotel were extremely helpful and we were moved into the new room by 8. We switched the TV on and caught part of ET Canada’s week-long feature on Chantal & Raine’s wedding vow renewal. Pretty cool and bizarre seeing friends featured on TV like that. The show was over and bellies were a-rumblin’. The search for food began at 10. 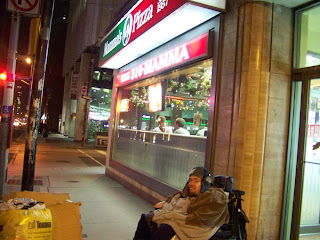 We wandered up and down Yonge St. a bit to see if any restaurants caught our eye and ended up stopping at Mamma’s Pizza. We grabbed our grub and took it back to the hotel just as a light snow began to fall. Mom had manicotti and I had gnocchi, it was great. I need to find some gnocchi like that around here. Completely exhausted, I was in bed at 1 AM. The next day was set to be the big day of the trip, I wanted to be wide awake for it.